It’s easy to get sombre, negative and depressed when thinking about the impact our ever-decreasing oil supply will have on life. It’s hard to predict how things will change, but I think this cartoon has got it right. It’s the best written, clearest view I’ve seen, and it’s funny too. 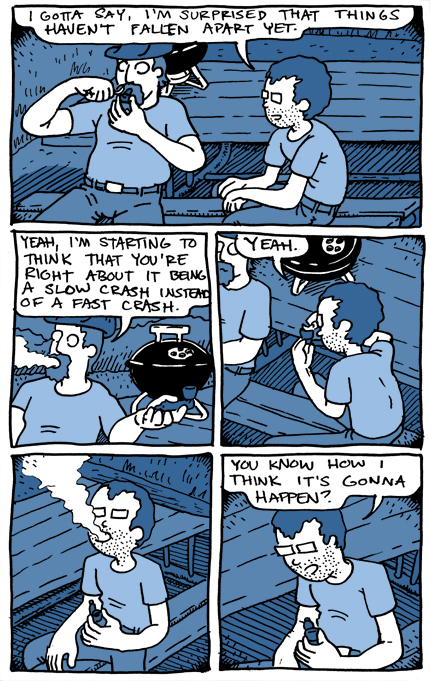 The excellent author is John Kinhart from Sorry Comics, and I found it via Powerswitch and The Oil Drum. 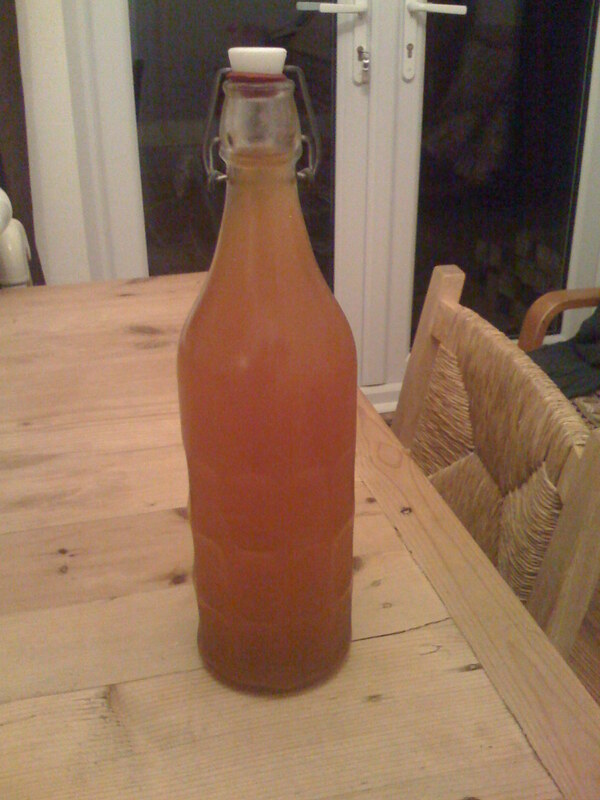 Went to a great cider-making workshop on Monday night. It was in Hulme, and organised as a joint workshop for Abundance Manchester and the Manchester Permaculture Network. It was a fun night – quartering the apples, shredding them and then crushing to get the juice, with a good break for eating all the delicious food everybody had brought to share. Everybody got some juice to take home too – we haven’t made ours into Cider, we drank it instead and it was delicious! The workshop gave a good grounding of the basics – I’d need to do a bit more reading before I was confident to turn the juice into our own cider. I’d also learn how to pasteurise the juice so that we could bottle a year’s supply for the kids too. As soon as our apple crops start to build up we’ll definitely look at making our own juice and cider. After all, cider is a great way to preserve apples for consumption through the year! I thought we’d missed the boat on this one, as you usually have to sow seed a lot earlier in the year, but I spotted some seedlings at the Altrincham Wyevale Garden Centre and thought we’d give it a go. They were sold as twelve seedlings for £2.99, were already a reasonable size and seem to be thriving. 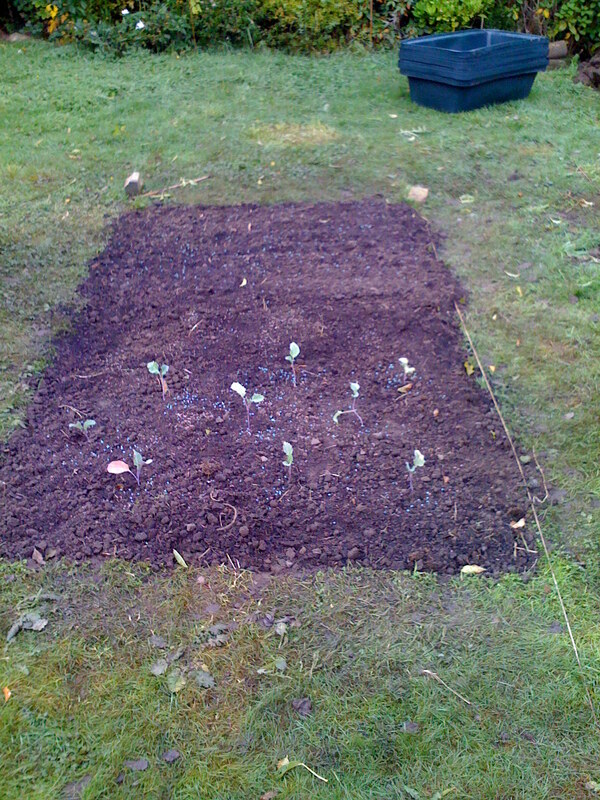 We’ve planted them 12″ apart, as per the instructions in “How to Grow More Veg” in our double-dug allotment-style bed. Apparently they should be ready to harvest in 34-36 weeks. We planted them on the 6th of October, so I’ll see how accurate that is when we get to harvest time. This is one of the earliest varieties – as discussed in my aged post on 18 different varieties of Garlic. We got ours from the local Homebase – £1.99 for a large bulb. They can be planted September to November and should be ready for harvest from May-August, a couple of weeks after the leaves yellow and die back. We bought two bulbs, and they have split into 20 good-sized cloves. Another one of our purchases from the Altrincham Wyevale, 100 bulbs (“sets”) for £3.49. We’ve planted all of these in the allotment bed, the packet says you can plant them from August onwards, and that they are an “Over-wintering” set. It’ll be interesting to see what yield we get – 100 red onions could last us all year! It doesn’t say when to expect the harvest – just to wait until the tops start to die back. We’re planting sets rather than seed as they are apparently a lot more reliable. Not a very resilient solution though, so maybe we’ll try and harvest some seed for next year’s crop. Also from the Altrincham Wyevale, 100 sets for £3.49 again. These haven’t gone in the ground yet as we’ve run out of space in our single bed. Time for some more digging I think! This was a bit of an impulse buy at Wyevale. And the thing I hadn’t spotted on the label was the crucial “protect from frost”, so they haven’t been planted in the ground, but in pots that can be taken into the polytunnel when it gets frosty (assuming we ever get the polythene on the tunnel!). I don’t rate their chances of lasting the winter, so we may have to build them a cloche or a coldframe. All of the gardening magazines are listing these as things to plant now, so I got some as we were passing the seed aisle in B&Q. They haven’t gone in the ground yet – no space! But that’s ok, as the packets say to plant them Nov-Dec, with harvesting from April (Sutton) and May (Aquadulce Claudia). The Sutton beans suggest they need a cloche too – looks like I might be busy trying to work out how to make cloches! Thats all that’s going in for us this autumn – I’ll let you know how we get on. We’re making slow and steady progress on the polytunnel now. We had put off doing all the timber work while we dug the beds inside the tunnel, and got all of the aquaponics system ready. However, with the delay we’ve had sorting out the stands for the aquaponic growbeds we decided to get the timberwork all done and the polythene up. At least that way we’ll have somewhere warm to garden as the weather gets chillier! 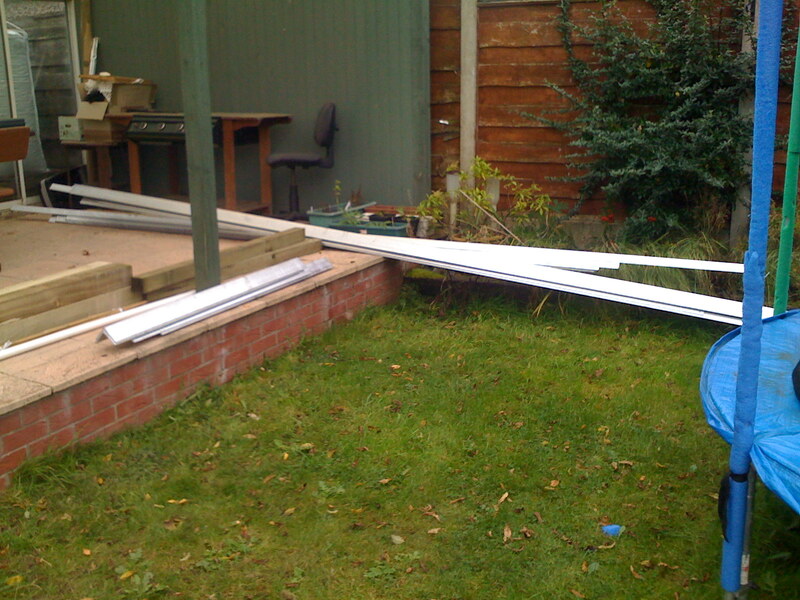 So we had a good go at the timber on the weekend – building doors (one large at the back, double doors at the front), door frames, and the timber rails that go around the bottom to attach the polythene to. We didn’t quite get it all done – the rails still have to be attached to the bottom of the polytunnel – but we do now have doors, and door frames attached to the tunnel. It’s starting to look almost finished! While it’s taken us a while we haven’t had any problems following the instructions – good job by First Tunnels. OK, don’t get too excited, we haven’t got to the top of the 15-year queue for allotments. What we are doing is starting to turn large amounts of turf into productive garden beds. In addition to the Aquaponics system we have in our polytunnel, we are going to have eight conventional allotment-style beds. Each will be 5’x20′ and we’re going to try the planting styles detailed in the excellent “How to Grow More Vegetables: And Fruits, Nuts, Berries, Grains, and Other Crops Than You Can Imagine“. This means we’re planting a lot closer together than the instructions on the packets, and we’re not planting in widely spaced rows. According to the book, this should give us maximum yields with minimum weeding and we should be able to reach every plant in the 5-foot wide beds without walking on the beds at all. The downside? It’s all about the soil! So that means digging . . . lots of digging. And compost . . . lots of compost. Luckily we seem to have really good, deep topsoil. From digging the holes for the sumps in our aquaponics system I know it goes down about three feet. Unluckily it has had turf on it for a long time and so it is incredibly solid – too compacted to consider planting into, and it’s causing real drainage problems. So, we dig, and dig, and dig. The book calls for double-digging which is hard work but at the end of it the difference is amazing. These big thick slices that we’re levering up break apart into a beautiful fine soil and with plenty of compost mixed through it is finally possible to think of this piece of ex-lawn as a possible vegetable garden. That’s half of one of the eight beds – it’s 10’x5′, fully double-dug with a couple of big bags of compost dug through for good measure. We’re now planting it up with over-wintering onions (red and white), garlic, and purple-sprouting broccoli. This is our first real go at growing our own food, so wish us luck! 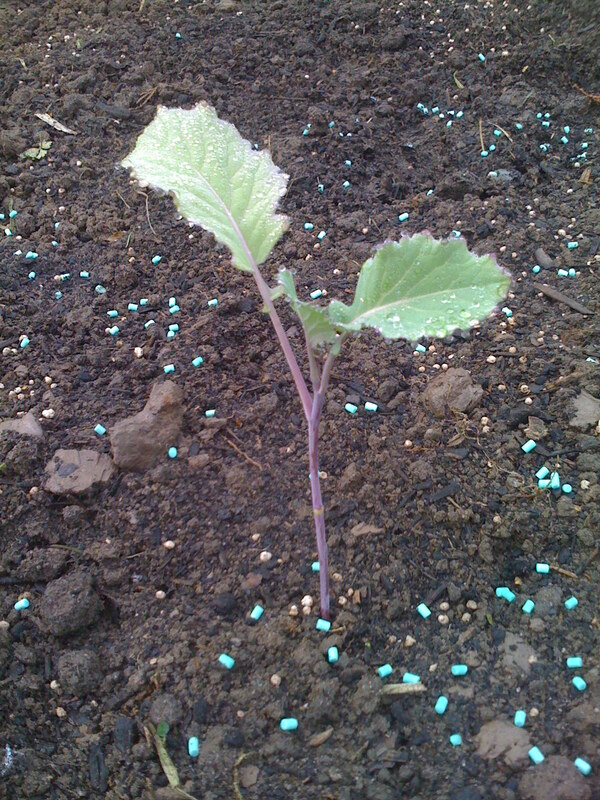 Hopefully the slugs haven’t eaten it all yet!